I've ranted before against the perils of delegated social strategies. You know: Management decides it's time to get into social media, and appoints some whippersnapper to the task. The potential perils with this approach are many and severe, but even under good circumstances, this approach comes with a steep lost-opportunity cost. And that -- even if we ignore all the ways a lone-gunman social strategy can backfire on a good company -- is a very compelling reason to spend less energy thinking about your business's social strategy and more energy thinking about your company's social culture. In a delightfully insightful opinion post on Fast Company last week, Bulldog Drummond CEO Shawn Parr advanced the observation that "culture eats strategy for lunch." The point, in brief, is that no matter how much strategic thinking you do, the culture of your company will either bolster your success or unravel your elegantly wrought plans. And while Parr didn't talk about social specifically, it occurred to me that this is a great opportunity for some dialog about the overwhelming impact of company culture on the effectiveness of social campaigns. Good leaders know how to delegate, so there's no great shock in the observation that most business leaders offload social media projects to underlings, henchmen, and Twitter-savvy interns. But as in so many areas of 21st-century business, the anachronistic nature of the social web has changed the rules and turned the delegation instinct into a liability. The kinds of interactions that build really valuable relationships -- as opposed to canned or forced marketing messages -- between brands and their followers require a real connection to the people behind the brand. At the very least, that means that the people whose fingertips are typing out tweets and responding to users in forums and other online communities need to have the power and autonomy to respond as directly and effectively as possible to your customers on the web. In a more ideal scenario, it means the CEO should be one of those people, monitoring the socialverse and representing the brand through direct engagement. Does that mean the top brass should redirect all its energies to surfing Twitter and Facebook feeds? Of course not. But there's no question that when business leadership is in the loop on social activity as a matter of daily business, companies are more effective at responding to crises and opportunities in the social sphere. Conversely, in my observation, if your top executives aren't directly involved in your social efforts, your company's prospects for social success are limited. Realistically, though, executives can only do so much, and your CEO can't tackle the social web alone any better than that one intern in Marketing can. To ensure social responsiveness, you need to get people involved from all areas of your business and empower your social listening team to enlist help from anyone -- absolutely anyone -- within your organization. On a recent visit to Round Rock, Texas, I spent some time in Dell's Social Media Command Center and had some enlightening conversations with the team responsible for responding to the company's customers on the web. 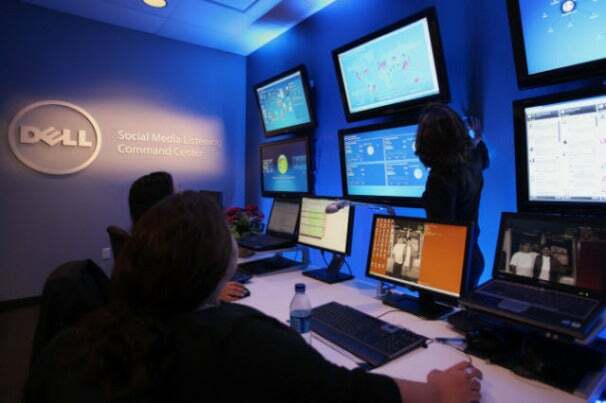 The most striking thing I noticed -- apart from the NORAD-style wall of monitors awash in Radian6 social maps -- is that, for such a large company, Dell's social media team is anything but siloed. Rather than simply leave social response to the social media response team, Dell empowers its social team to call in engineers, sales people, shipping and fulfillment workers, and even executives to respond to issues as they arise on the social web. So if a customer has a strange problem with their laptop and doesn't get satisfaction from the tech support line, Dell can intercept that customer's complaint on Twitter and bring in an engineer who actually worked on that laptop's design to respond and solve the problem. It's a sound strategy that acknowledges how disgruntled customers use social media, and helps the company respond intelligently to inevitable gripes on Twitter and other social forums. You don't have to be a $40-billion company to execute a strategy like this. Even if your social command center is really just one person listening watching for brand mentions on Twitter and the web during the course of their workday, you can empower that person to call in the big guns from across your organization whenever a customer needs attention. The cost of doing so is almost certain to be small -- usually just the time it takes for a department head to read a tweet and type a reply. The cost of not doing it could be (as dozens of blundering brands have already demonstrated) days of lost productivity for your leadership as you scramble to make up for an otherwise avoidable mistake. Business is inherently social, and business in the online age demands a strategy for social media. If your business isn't already going social from top to bottom, it's time to get your leadership up to speed. Have your own tales of climbing Mount Social? Share them with us in the comments, or talk to us on Twitter.